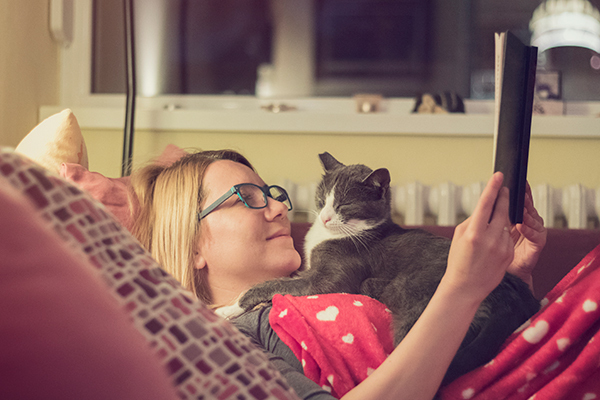 Ensure your cats enjoy the holidays by thinking about them in advance and from their perspectives. Let's take a look at some safety tips. 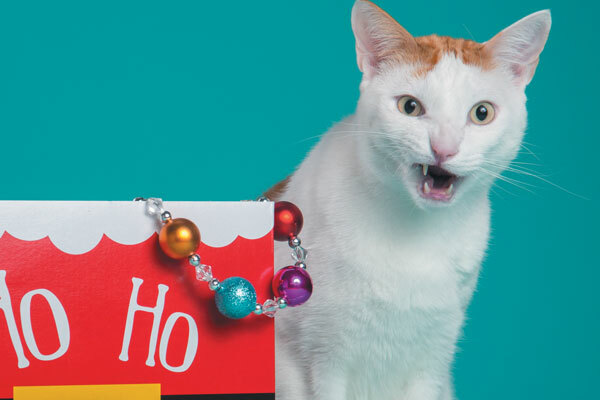 Instead of purring, many cats would say “bah humbug” about the holiday season. More than anything else, cats disdain unpredictable change. Cats don’t have calendars or explanations for what the holiday season means. And if they did, I suggest most cats would become like bears and hibernate throughout all the holiday commotion. Then there are the cats who seem to enjoy it all. Feline-specialist veterinarian Dr. Drew Weigner, incoming president of the nonprofit Winn Feline Foundation, adds, “Some cats do welcome every guest into your home — they’re social and love all the visitors.” Whether your cat isn’t a fan of strangers or welcomes them with open paws, it’s better to be safe than sorry during the holidays with these rules of thumb, er claws. The front door is a way for your cat to try and escape stress so make sure it’s closed. Photography ©karamysh | Getty Images. With doors constantly opening and closing, what you never want is for an indoor-only cat to bolt out an open door. “Don’t expect your guests to think about how important it is to not let the cats sneak out,” Dr. Colleran adds. If you’re expecting a lot of company for a large gathering of family and/or friends, sequester the cats into a safe room. (This is true even for social cats until all your company has arrived, when the front door is no longer opening and closing.) Most cats will be more content in a safe room until the party ends. It might help to turn on soothing music or music specifically made to calm cats (there is such a thing). Don’t let guests try and go after your cat who is hiding. Photography ©alexey_ds | Getty Images. To feel safe, some cats prefer to hide when there’s company. 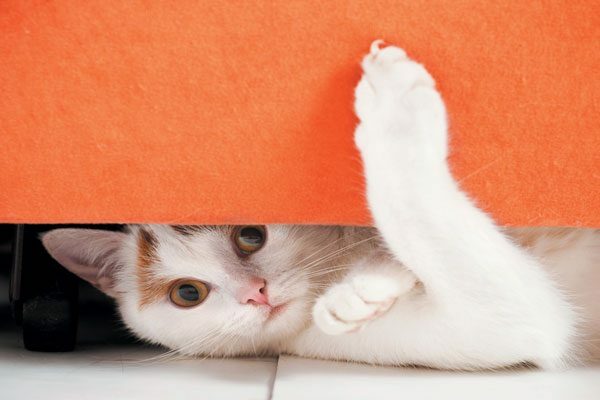 Dr. Weigner notes that everyone, it seems, wants to say hi to a family dog, but people aren’t always as determined to find the cats hiding under a bed. “Never force the cats to meet your company,” he says. Or worse, allow cat-loving Aunt Matilda, who thinks of herself as a “cat whisperer,” to crawl under the bed to “soothe” the fearful cats. Aunt Matilda will only further terrify them. Also, if there are young children visiting, make sure there’s adult supervision. And never force the cats to interact with children if they’re not inclined to do so. Always allow the cats to be in control and to decide to greet guests when and if they’re ready. That’s why cats gravitate to the one person in the room ignoring them (often because he or she is allergic or doesn’t like cats). Keep an eye on your cat to make sure he isn’t acting weird around guests, including other pets. Photography ©humonia| Getty ImagesImages. A trend today is traveling with your pet(s). 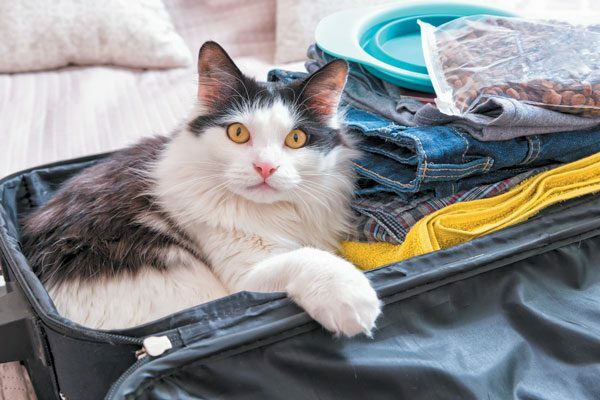 Even for those few cats who may prefer to hit the road with their people, it may not be fair to expect to stay in a home with resident cats. But all friends and relatives aren’t fair. It’s certain that your cats wouldn’t invite the feline intruder. Definitely, visiting cats should be sequestered in the guest room — and the door scrupulously kept shut. “Even when the visitors go home, the Feliway that’s already plugged in should stay plugged in because the cats who live in the home will know who’s been in that room, even after thorough cleaning. And Feliway may calm their frazzled nerves. Make sure your cat is eating and using the litter box when house-guests visit. If not, or if you feel your cat’s quality of life is being impacted by fear, contact your veterinarian. There are nutraceutical supplements and pharmaceuticals that can help lower anxiety. Our cat Charlie hides when visitors are staying , but everyone respects his wish, as he is timid and prefers to observe from afar. Very good advice! Thank you.